Two horses are rescued amid massive California wildfires. Many have burned to death. Image: CNN. Wildfires in California are continuing to have a devastating impact on people and animals. This is especially true of horses. And that’s where we come in. Many horses have burned to death. Many horses have been severely burned and need our help and support. Evacuated horses need food and water. We are doing all we can, but we need your help. Help us refill our Emergency Fund. We have nearly exhausted our Emergency Fund providing wildfire relief for horses. There is still so much more to do. Typically we use our Emergency Fund for winter hay to those in need. And winter is only just starting. But we couldn’t ignore the many pleas for help for the wildfire horses. All donations will be doubled by a generous benefactor who has already helped with generous private donations to help keep this funding going for wildfire horses can horses in need this winter. We are so grateful for his generosity! And of course yours. • Sign up to give $5 a month for 6 months. It cancels automatically. Your $30 donation will be matched right now! If you have already given, thank you so very much for your kind generosity. Speed Miller and his 21 year old Tennessee Walking Horse, Frisk. NOAH ELLIOT MORRISON. FOR YEARS NOW, alert motorists on Detroit’s west side have been treated to an unusual sight. They have posted photos of what they’ve seen on social networking and even sent them to our office, in surprise and in puzzlement, but mostly in delight. What they have witnessed is a young rider on a Western saddle guiding his horse down West Seven Mile Road, past the gas stations and fast food restaurants, a sight that seems so out of place in the car-centric Motor City as to be remarkable. Late this summer, the horseman finally calls and invites us to watch him ride. On a recent morning, we drive over to a house near the intersection of West Seven Mile Road and the Lodge Freeway. There we finally connect with 21-year-old Speed Miller, the “Greenfield Gaucho” we’d seen photographed so widely. He speaks with us while he carefully guides his 12-year-old Tennessee walking horse named Frisk out of a stock trailer, carefully grooming the animal, which eyes us contentedly. Miller credits his love of horses to his grandfather, the elderly man who watches from the porch for a moment before allowing his grandson to handle the reporter and photographer. The elder has owned a 44-acre farm outside of Belleville for generations, and that’s where the young rider began his love affair with horses. That fascination began with his mother, who found encouragement from Miller’s grandfather when she climbed into the saddle decades ago. [ ] when Miller began riding in the city and saw how young Detroiters connected with the animals, he realized he could offer them the same joy he found in horses. Speed Miller and friend riding around the neighborhood. NOAH ELLIOTT MORRISON. Botticelle horse by the Coliseum in Rome. Shutterstock image. (ANSA.IT) ROME, ITALY — Rome’s famed ‘botticelle’ horse-drawn tourist carriages are to move from the streets of the Italian capital to its villas’ parks under a measure passed by the environmental committee on Tuesday, 25 September. The move is set to be put to final approval by the mobility committee “within the first few days of October”, sources said. “Among the key aims of the measure is to avoid all suffering to the horses, taking the botticelle activities to more suitable locations like parks and historic villas,” said the head of the Rome environmental committee, Daniele Diaco of the ruling anti-establishment 5-Star Movement (M5S). It will also be possible for drivers to switch jobs and apply for taxi licenses, he said. Since no new botticelle licenses will be issued, the carriages may disappear if all 32 drivers apply to become taxi drivers. 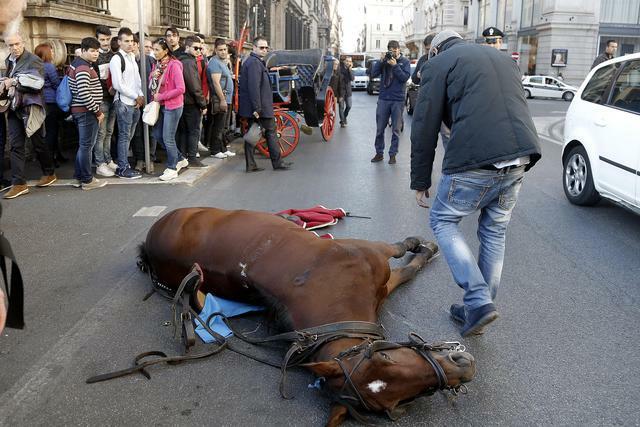 Animal rights groups have long complained that the horses are subject to too much stress and strain on Rome’s hot cobbled streets. Too much stress and strain? Hot cobbled streets? Yes, we agree. However, that’s only the beginning of what these horses suffer. Pictures say a thousand words. Look familiar? 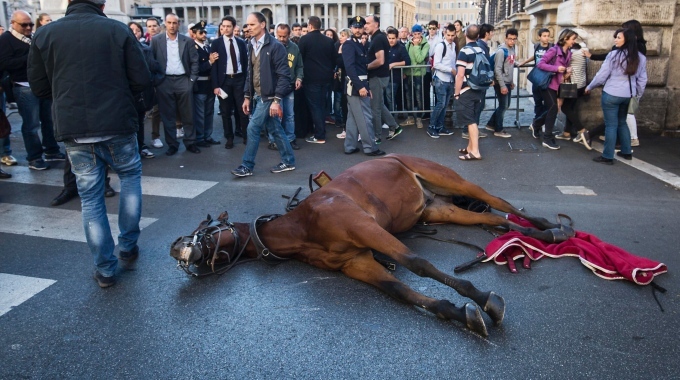 Downed botticelle horse, Rome, Italy. Source not cited. 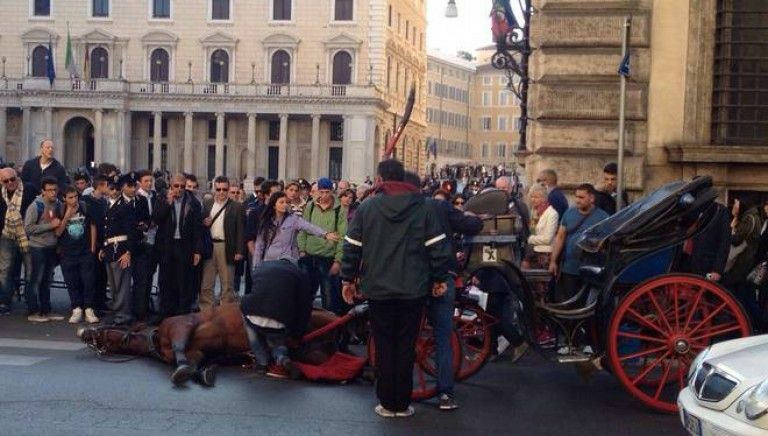 Downed botticcelle horse, Rome, Italy. Source not cited. Botticcelle horse suffering heat exhaustion waiting for his next trip, Rome, Italy. Source not cited. Another distressed botticelle horse in Rome. Source uncited. Where do the horses live? The same type of miserable conditions, totally unnatural for a horse, as any other carriage horse in any other city. This is a worldwide system of abuse. Angelo Sed, president of the Romans horse-drawn carriage drivers (botticelle), prepares his horse “Inventore” before a day of work on October 2, 2014 in Rome. The Botticelle are the traditional Roman carriages used by tourists to sight Rome’s historical center. ALBERTO PIZZOLI/AFP/Getty Images. 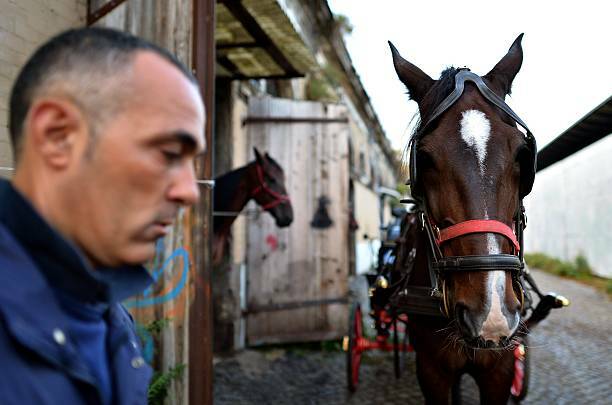 Angelo Sed, president of the Romans horse-drawn carriage drivers (botticelle) and his horse “Inventore” arrive at the stable after a day of work on October 2, 2014 in Rome. The Botticelle are the traditional Roman carriages used by tourists to sight Rome’s historical center. ALBERTO PIZZOLI/AFP/Getty Images. We can’t use this image linked here without paying for it, but it shows what the typical stall looks like. 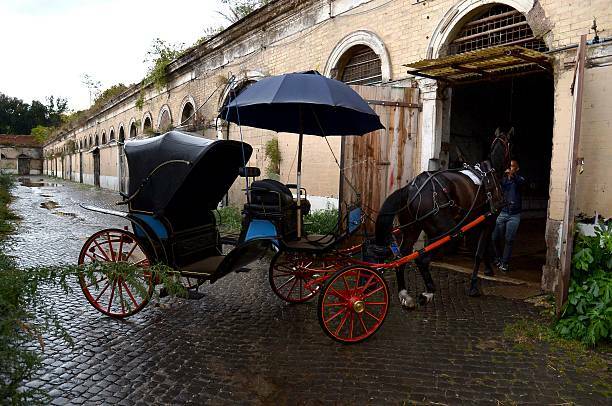 Even with moving Rome’s carriage horses to park like settings, the horses will still be working in the same weather conditions, still living in the same crumbling buildings totally in situations totally unnatural to a horse, pulling heavy loads of tourists, and can still be spooked. Here is the intended replacement for the horses. 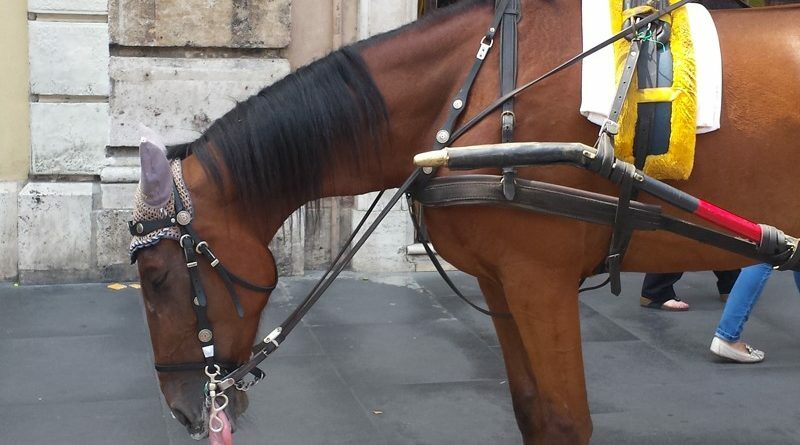 Replacement cars for carriage horses in Rome, Italy. Imgur. Click to visit source. This is the best we can hope for. However, what will happen to the horses? Turned into sausages no doubt, an Italian gastromic favourite. 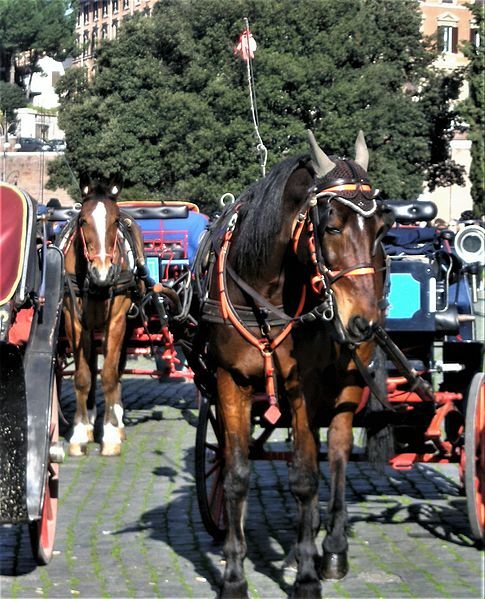 Botticelle, historical carriages pulled by horses used for tourists in Rome, Italy. Wikimedia image.